Glock means reliable self-defense and superior function for police and civilians. But CaseCruzer understands that in a troubled world, even a quality handgun requires a protector. A safe, secure storage solution that travels on the right side of the law. Walk the line with the new Glock 19 Single Gun Case by CaseCruzer. The Glock 19 Single Pistol Case is a perfect match for its namesake. The interior design includes snug foam cutouts for a single handgun and up to three magazines. And like a Glock — the preferred choice among law enforcement professionals — the carrying case exterior is compact, lightweight and no-nonsense tough: it travels with an unconditional lifetime warranty. Police and civilians need an accurate, reliable firearm for self-defense. A brand-name handgun needs constant protection from rust, moisture, extreme climate change and sudden impact. The Glock 19 Single Gun Case makes the grade with a mix of premium certifications: MIL-STD-810F (resistant to UV, solvents, corrosion, fungus and impact damage); MIL-STD-C-4150J (water-proof); MIL-STD-648C (automatic ambient pressure equalization valve); and IP67 (protection against dust and the effect of immersion between 15cm and 1m). Theft is another feared enemy of America’s most trusted and popular handgun. That’s why the new addition to the CaseCruzer line of reusable shipping solutions is fitted with a trigger-release latch system and flanges for padlocks. For comfort when transporting, the carrying case uses an ergonomic snap-down rubber over molded cushion grip handle. The latch system meets Transportation Security Administration (TSA) specifications and is Air Transport Association (ATA) rated. That’s good news for law enforcement professionals and civilians who can now travel by air safely and by-the-book. The Glock 19 Single Pistol Case is an excellent travel reminder — or warning — to motorists. Too many law-abiding citizens run afoul of the law by driving across state lines with firearms that are not properly secured in containers that can be stored in the trunk of a car — not the glove compartment and not with ammunition. 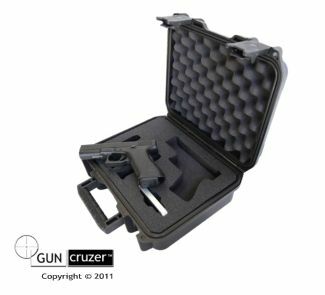 No worries, because the CaseCruzer single gun carrying case is easy to store and travel with. It weighs a mere 3.80 lbs. with foam and its exterior dimensions are a trim 13.18” L x 11.12” W x 5.21” H. One color: basic black. Glock has a reputation for high standards. The same is true of CaseCruzer. When traveling with a handgun, live by the rules, and honor the ideals of a free nation: respect thy neighbor and the right to bear arms. CaseCruzer — America’s protector of protectors. Portable Deployment Motorola Carrying Case accommodates six Motorola XTS-5000 radios, six spare batteries, and a six-bay charger unit.